Our 418 national parks are an extraordinary and unique treasure. We have visited quite a few of them regularly since 2002 for this independent, advertising-free educational project. We have written a collection of interesting articles about activities, the environment, and people. We have also taken countless photographs to accompany the articles and offer the best of those images. We want to share our work with you. We have prepared writer-narrated slide shows and unique informational graphics as well. We are based in South Florida. Students participating in the project are part of programs in the School of Communication, University of Miami, but primarily in the Journalism and Media Management Department. They are typically in three journalism classes (JMM 446 / 646, travel writing; JMM 208, news reporting; and JMM 544 / JMM 644, feature writing). Led by Dr. Bruce Garrison, we occasionally enlist the assistance of Prof. Randy Stano and his design and advanced graphics students in our work. In this on-going student journalism project, our writers visit the nation’s national parks, historic sites, monuments, recreation areas, and preserves. We invite you to take a look at our work. We offer more than 745 feature article and photography pages about the unique activities, natural beauty, special features, wildlife, nearby communities, and the amazing people of these parks. Writers and photographers, from left, Brittany Chandani, Jessica Puterman, Elyse Waterman, Jenni York, and Amanda Torres visited Rocky Mountain National Park outside Estes Park, Colo., in fall 2018. In fall 2018, we are visiting Rocky Mountain National Park and the Estes Park, Colo., area. We have five writers and photographers working there. They are Brittany Chandani, Jessica Puterman, Amanda Torres, Elyse Waterman, and Jenni York. Other reporters and writers in JMM 544 visited South Florida and other national parks. They are Lindsey Bornstein, Shellie Frai, Julia Kohl, and D’Andre McIntyre. Siyuan Tong, Lingyue Zheng, Nick Sirio and Gianna Nolte pause at the entrance sign of Grand Canyon National Park near Tusayan, Ariz., in spring 2016. In Spring 2016, we visited the Grand Canyon National Park and several national parks in South Florida. Writers on the trip to Arizona include Gianna Nolte, Nick Sirio, Siyuan Tong, and Lingyue Zheng. Writer Lee Eisen went to Washington, D.C., to visit the Chesapeake & Ohio Canal. Other writers working on spring stories in South Florida included Melissa Cabral, Katherine Moore, and Alexandra Silver. Our Fall 2015 trip took us to Yellowstone National Park and into Utah, Idaho, Montana and Wyoming. Student writers from JMM 446 making the trip included Marwan Alenezi, Vivian Braga, Asmae Fahmy, Maria Hernandez, Melissa Soto, and Siyuan Tong. 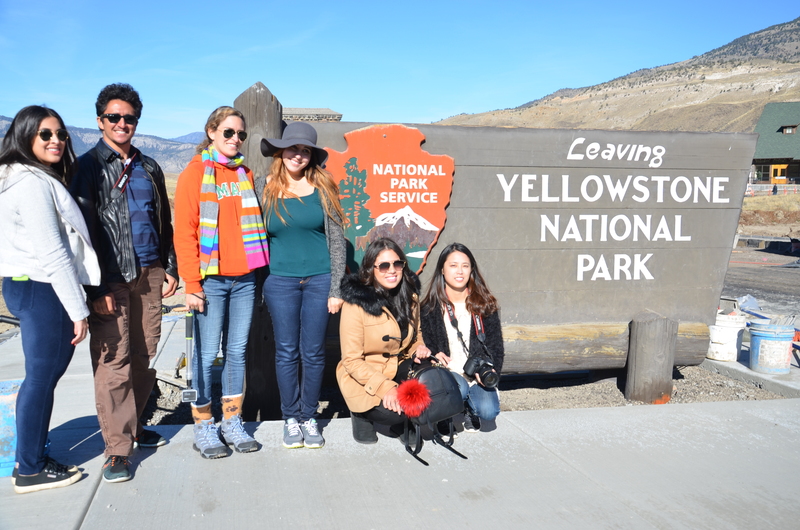 Journalists Maria Hernandez, Marwan Alenezi, Melissa Soto, Asmae Fahmy, Vivian Braga, and Siyuan Tong at the Yellowstone entrance at Gardiner, Mont., in fall 2015. Other JMM 446 writers working on Fall 2015 projects took them far and wide for reporting, included visits to Alaska, California, Pennsylvania, New Jersey, and Florida. The group included Jordan Coyne, Chiara Digiallorenzo, Emily Eidelman, Andrea Fernandez-Bravo, Stephanie Freire, Marcus Lim, Kit Pilosof, John Rioux, Diana Rodon, and Renee Vesselinovitch. Briana Scott from JMM 208 also contributed a Florida story in Fall 2015. In Spring 2015, students from CNJ 208 contributed issues stories to the site. Writers included Hanya Al Khamis, Taylor Brotons, Madison Cramer, and Shakira Molet. 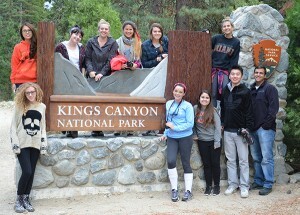 Writers who made the trek to Sequoia and Kings Canyon National Parks in fall 2014 included, from left top row, Siyuan Tong, Megan McCrink, Stephanie Meadows, Donatella Vacca, Kate Geldmacher, and Jamie Servidio. From left in front, Melissa Ostroff, Lexi Williams, Emily Dabau, Jack Wang, and Gabe Ibrahim (Staff photo). For fall 2014, we worked in three groups at different locations. One group from CNJ 446 focused on South Florida and prepared stories about our southeast Florida parks. The writers and photographers were Orianna Cirigliano, Chelsea Harrington, Yael Herman, Valerie Lopez, Veronica Lopez, Roxanna Maza, and Jackie Salo. In October 2014, some members of our group flew to Los Angeles and drove north to Sequoia and Kings Canyon National Parks. Students traveling to California were Emily Dabau, Kate Geldmacher, Gabe Ibrahim, Megan McCrink, Stephanie Meadows, Melissa Ostroff, Jamie Servidio, Donatella Vacca, and Lexi Williams. Prof. Randy Stano and two of his members of his advanced graphics class, Ke (Jack) Wang and Siyuan (Sharry) Tong, also joined the group. The third group came from CNJ 208 students who prepared stories in Coral Gables about issues involving national parks. Fall 2014 projects are being completed at this time and are being posted. Reporters included Shivani Aluru, Gabriella Canal, Xuanchen Fan, Katherine Fernandes, Emily Joseph, Meaghan McClure, Kacie Nelson, Autumn Robertson, Gabriella Shofer, Dylan Weems, and Audrey Winkelsas. Spring 2014 projects were completed in CNJ 208. Student reporters whose stories are on our site include Clara Bendayan, Kelly Brody, Kerrie Heckel, Jenna Johnson, Nicole Lopez-Alvar, John Rioux, and Kyla Thorpe. Four of our writers visited Acadia National Park during the federal government shutdown in October 2013. Despite limited access, we were able to report and prepare a set of stories for our readers. Writers are, from left, Margaux Herrera, Rianna Hidalgo, Mikayla Vielot, and Anabell Bernot (Staff photo). Projects for fall semester 2013 included two groups of students from CNJ 208 and CNJ 446. CNJ 208 contributors were Danielle Cohen, Rebecca Cohen, Rebecca Fernandez, Adam Hendel, Daniela Longo, Melissa Mallin, Melanie Martinez, Shai Savariau, Alexandra Silver, Axel Turcios, Valeria Viera, Matias Wodner, and Marissa Young. CNJ 446, travel writing, students were Anabell Bernot, Isabel Brador, Ingrid Castillo, Pablo Chacon-Alvarez, Morgan Coleman, Nicky Diaz, Karla Durango, Morgan Golumbuk, Katie Guest, Margaux Herrera, Rianna Hidalgo, Andrea Jacobo, Samantha Lucci, Stephanie Parra, Patrick Riley, and Mikayla Verlot. Projects completed during spring semester 2013 involved two groups of writers. COM 395, a special topics course focused on national parks and news media, contributed one set of issues stories. Writers included Zach Beeker, Daniel Cepero, Mattan Comay, Jake Gillman, Lyssa Goldberg, Leanne Kaplan, Alysha Khan, Stephen Klein, Ashley Martinez, Trevor Maxim, Darci Miller, Sami Ponoroff, Daniel Pyser, Gretchen Schroeder, and Kristin Spillane. CNJ 216, news reporting, contributed a second set of issues stories. CNJ 216 and CNJ 208 writers included Orianna Cirigliano, Kathryn Collins, Kelly Danaher, Hannah Hawks, Michael Joiner, Alexa Pappas, Ana Plata, Carlee Rasner, and Donatella Vacca. We worked a variety of projects for fall 2012. Students visited six Florida parks as well as parks in Colorado, New York City, and Washington, D.C. Fall 2012 writers are part of the newly formed South Florida Travel Writers Group and members of the CNJ 446, travel writing class. Writers are Mari Centeno, Laurie Charles, Andres Correa, Maleana Davis, Elizabeth de Armas, Rachel Janosec, Alexis Kanarek, Bolton Lancaster, Brandon Lumish, Chelsea Pillsbury, Rob Pursell, Vanessa Ramos, Emma Reyes, Daniela Rodriguez, Brittany Weiner, and Laura Yepes. Our fall 2011 projects took us to several states. In addition to our work at several parks in Florida, we also visited Wyoming and California. Students from three classes— two sections of CNJ 216, news reporting, and CNJ 446, travel writing— contributed their writing and multimedia projects. 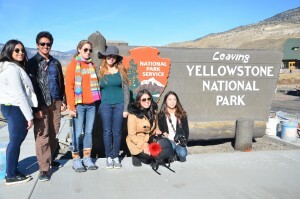 Travel writing students who traveled to Grand Teton National Park in Wyoming included Sandy Florez, Iku Kawasaki, Darci Miller and Antonella Stelluto. Graduate student Zongchao Li also contributed her photography. With the Grand Teton mountains behind them, from left, Iku Kawachi, Zongchao Li, Darci Miller, Antonella Stelluto, and Sandy Florez pause at the entrance of Grand Teton National Park, just north of Jackson Hole, Wyo. on a fall 2011 morning (Staff photo). 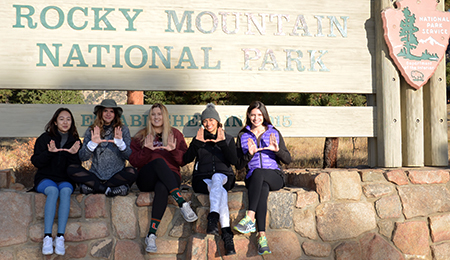 Students working in Joshua Tree National Park in Southern California included Stephanie Beyl, Edyna Garcia, Rachel Hartman, Rosa Orihuela, Esther Pang, Kelsey Pinault and Hannah Romig. Student writers Sasha Blaney, Jonathan Borge, Joe Cervone and Robin Segal worked in South Florida’s national parks. Our group gathers for a meeting at the patio of the Joshua Tree National Park Visitor Center in Twentynine Palms, Calif., in fall 2011. From front left, Rosa Orihuela, Esther Pang, Rachel Hartman, Stephanie Beyl, Kelsey Pinault, Edyna Garcia, Prof. Randy Stano, Zongchao Li, and Hannah Romig (Staff Photo). News reporting students worked on issues stories. A total of 26 reporters in two groups worked on individual parks projects. Writers in group one were Alejandra Acuna, Chip Brierre, Allison Gordon, Katie Guest, Matt Houston, Alexandra Hurtado, Alyssa Karas, Alysha Khan, Jordana Levinson, Kaeshawn Little, Brandon Lumish, Emma Reyes, Kimberly Sears, Jonathan Sheairs, Ely Sussman and Chris Wittyngham. Group two writers were Anabell Bernot, Ingrid Castillo, Mari Centeno-Ayala, Ivana Cruz, Nathan Currie, Jordan Emanuel, Daniela Goncalves, Luana Goncalves, Sunny Middleton and Saira Sumbai. The chilly Rocky Mountain National Park group pauses at the park’s entrance sign outside of Estes Park, Colo., in spring 2011. From left, Spencer Dandes, David Sargent, Prof. Bruce Garrison, Alex Roland, Zongchao Li, Lori Koutrokois, Tanya Thompson, Rebecca Lattanzio, Bolton Lancaster, and Prof. Randy Stano (Photo by Madison Sargent). The spring 2011 projects come from several School of Communication classes. Students worked in Rocky Mountain National Park in Colorado and at Everglades and Biscayne national parks in South Florida. Students in CNJ 544, feature writing, include Katey Ceccarelli, Alex Fruin, Diana Jordan, Rebecca Lattanzio, Alex Roland, Nicolette Roque, David Sargent, and Jamie Stephens. CNJ 216, news reporting, students working on the project include Omar Aldakheel, Ayram Edery, Stephanie Fleitas, Ariele Gallardo, Jeffrey Gibert, Sergio Guarneros, Margaux Herrera, Stephen Klein, Nicholas Moore, Joanelle Navarro, Nicole Orchard, Patrick Riley, Carmen Rodriguez, Janna Tsimprea-Swallow, and Daniela Vicentini. Lori Koutrokois, Bolton Lancaster, Spencer Dandes, and Tanya Thompson participated in the Rocky Mountain National Park portion of the project as part of their work in Prof. Randy Stano’s classes. Graduate student Zongchai Li contributed photographs and work on the Web site. The Fall 2010 Southern California group pauses at the ferry dock at the eastern end of Santa Cruz Island in the Channel Islands National Park. Our fall 2010 groups visited several parks. Writers and graphics designers visited the Channel Islands National Park and Santa Monica Mountains National Recreation Area in Southern California, Zion National Park and Bryce Canyon National Park in Southern Utah, and Everglades National Park, Biscayne National Park, and Dry Tortugas National Park in South Florida. CNJ 544 feature writers on our fall 2010 team included Alicia Abalo, Keilan Awong, Sasha Blaney, Kelly Burns, Christina De Nicola, Kelly Fitzpatrick, Camron Ghorbi, Jasmine Henderson, Danielle Kaslow, Jenna King, Alexandra Leon, Nicole List, Nancy Oben, Alex Pearce, Harrison Raboy, and Olivia Woolbright. Prof. Randy Stano’s CVJ 409 Advanced Feature Design graphics students are also contributing their work to the project. Public relations graduate student Zongchao Li assisted during the trips to California and to Nevada-Utah. We introduced a new Parks Online section to the Web site in fall 2010. This site focuses on parks resources on the Internet at both the national and international levels. Students in CNJ 515, Reporting and the Internet, generated the new content. Members of the group included Alex Bryant, Kelly Burns, Alex Fruin, David Furones, Abigail L. Garner, Nina Green, Austen Gregersen, Sarah Hartnig, Iku Kawachi, Rebecca Lattanzio, Alex Pearce, Kelsey Pinault, Debora Rubi, Robbie Shiver, and Kyli Singh. The spring 2010 group meets on the International Building Patio (Photo by Bruce Garrison). The spring 2010 projects are being developed by students in CNJ 446, travel writing, CNJ 216, news reporting, and Prof. Randy Stano’s CNJ 382, publication planning and editing. Students working on the fall 2009 assignments were in CNJ 544 feature writing, CNJ 216 reporting, and Prof. Randy Stano’s CVJ 419, information graphics. Feature writing and information graphics students traveled to four national parks. Our fall 2009 writers meet on campus to work on their projects (Photo by Bruce Garrison). Writers who traveled to Yosemite National Park in California were Elena Chiriboga, Ramon Galiana, Zander Kean, Yiyun Luo, Lauren Sagaser, and Dongran Sun. Writers working in South Florida, including Biscayne National Park, Everglades National Park, and the Dry Tortugas National Park, were Cindy Acosta, Ashley Calloway, Farah Dosani, Nina Markowitz, Sheena Morales, Jon Moss, Lindsay Noris, Misha Vaidya, and Natalia de la Vega. Information graphics students contributed their locator maps, charts, photographs, and other visual information content for the projects at Yosemite, Biscayne, and Everglades national parks. Students included Tiffany Agam, Shayna Blumenthal, Tia Dawkins-Hendricks, Jenna Farmer, Ken Garcia, Bill Gerdts, and Kiersten Schmidt. Reporting students contributed a new set is national parks issues stories based on reporting from the Miami area. Reporters on the project were Kalea Aguon, Adam Berger, Jessica Buffi, Mandy Dilenno, Kelly Fitzpatrick, Marina Granziera, Yvette Jon, Jared Levine, Jay Marshburn, Jennifer Medvigy, Chhaya Nene, Meredith Reilly, Jeremy Rosenthal, and Jasmin White. The students who traveled to the San Francisco Bay area in April 2009 pause at dinner at a restaurant on Fisherman’s Wharf (Group photos by Bruce Garrison). Our travel writing class members visited San Francisco and New York in spring 2009. While many of our stories focus on the activities and history of the San Francisco Bay area parks and recreation areas, readers will also find several new looks at the historic sites of the New York City area as well. Members of our group in spring 2009 included Nicole Bradley, Leslie Carleton, Monica Castro, Marissa Eubank, Meaghan Fondiller, Kashae Foster, Kaci Fowler (San Juan’s Nuyorican Cafe), Joey Held, Jannet Jureidini, Kate Koza, Karunya Krishnan, Gabrielle Officer, Valerie Reyes (St. Paul’s Church), and Erin Schlissel. The journalists who traveled to the U.S. Virgin Islands in November 2008 pause at the park Visitor’s Center sign on St. John Island. In fall 2008, two groups of students in our feature writing class contributed stories and photographs to the Web site. One group focused on the U.S. Virgin Islands National Park on St. John Island in the Caribbean. The second group of students looked at South Florida’s Everglades National Park, Biscayne National Park, and the Big Cypress National Preserve. Student journalists on these projects included Danielle Alvarez (coral reef, mangroves), Blair Brettschneider (Royal Palm trails, Biscayne activities), Gabriela Campos (parasailing, Hassel Island), Leslie Carleton (Everglades airboat ride, tram tour), Heather Colvin (Oasis camping), Brook Frazier (kayaking, Annaberg mill), Laura Funk (Reef Bay Trail, trails and beaches), Jannet Jureidini (Biscayne anniversary, art photography exhibit), Cali Madia (Vietnam Memorial, Biscayne concessions), Samyog Pokhrel-Willett (St. John vegetation), Victor Rodriguez-Orrego (Biscayne visitors, Biscayne promotion), Kendall Sale (Cruz Bay, park relations), Rachel Steinman, and Stacey Weitz (alligator wresting, annual fish count). In spring 2008, we travelled to Northern California and our writers visited park system sites in the San Francisco Bay area. Others in our group worked in South Florida and in a few other parts of the country. Our group included Nicole Alibayof (Rosie the Riveter, Alcatraz), Rosa De Armas (Palace of Fine Arts, Maritime Park), Alcione Gonzalez (Shark Valley bike, San Francisco bicycle tour, Radio Free Alcatraz), Michael Holt (Kosciuszko House), Adriana Martinez (Biscayne boat tour, kids activities), Anthony Minerva (lighthouse, African Diaspora Museum), Matt Mullin (Point Reyes), Lorena Puch (Everglades tours, Coopertown airboats), Fatima Reynolds (Fort Point, Fort Funston), Karina Smuclovisky (Year of Reef, Columbus Day Regatta), Lily Stofman (Valley Forge camp followers, Muir Woods and wine, Alcatraz families), and Ligia Vidal (Everglades pests). Writers working in spring 2008 on the second installment in our series of articles about issues and problems facing the national parks includes Tamika Bickham (quagga mussels), Ben Candea (Yellowstone wildfires), Farah Dosani (park noise), Corey Erb (promoting parks), Andrew Green (guns), Analisa Harangozo (gateway cities), Joey Held (invasive species), Hannah Holdren (invasive trout), Andrea Leontiou (seashore preservation), Bryan Llenas (Valley Forge development), Chris Nielsen (border security), Leyla Patel (endangered panthers), Ilyssa Plantada (Everglades birds), Natalie Riera (weather impact), and Chris Valencia (parks trash). The fall 2007 group pauses during its project work at the Wolfson Building. We visited Puerto Rico in fall 2007 as well as continuing our work about the parks of South Florida. The student journalists who went to San Juan wrote about the San Juan National Historic Site and neighboring Old San Juan. Those focused on South Florida wrote about the Everglades National Park and Biscayne National Park. Members of our fall group included Juliana Accioly (cannon restoration, shopping), Rene Basulto (plazas, El Morro), Vincent Daniello (maritime, lighthouses), Alcione Gonzalez (Bacardi, day activities), Adriana Martinez (Anhinga, canoeing), Danielle McNally (Casa Blanca, wall restoration), Megan Ondrizek (conservation, field trip), Joanna Salazar (intern, volunteers), Erin Schlissel (Andanza, mason), Veronica Sepe (recreation, Old San Juan), Amy Sofka (feeding wildlife, manager profile), Lily Stofman (La Garita del Diablo, coqui frogs), Angela Sturrup (safety, maritime), Caitlin Trowbridge (volunteers, preservation), and Hunter Umphrey (park historian, city colors). Juliana Accioly, Kelly Asher, Vincent Daniello, Alcione Gonzalez, Danielle McNally, Veronica Sepe, Lily Stofman, and Bruce Garrison contributed their photographs to the San Juan portion of the project. Our spring 2007 group that journeyed to Washington, D.C., New York, Biscayne Bay, and the Everglades gathers on campus. In spring 2007, we traveled to Washington, D.C., to write many of our feature stories. We also had some of our writers focused once again on South Florida’s units of the park system. Another student visited New York City for one of her stories. Members of the spring 2007 writing team included Danielle Cohn (American Indian Museum, Air & Space Museum), Marcos Colon (Natrional Portrait Gallery, Natural History Museum), Ashley Davidson (Ford’s Theatre, American Art Museum), Elise Fender (Cherry Blossom Festival, Kite Festival), Diana Gdula (planetarium, Kenilworth Gardens), Alexandra Gordon (sea turtles), Hayley Halvorson (Federal Hall, Biscayne snorkeling), David Lake (World War II-Korean War Memorials, Douglass home), Bari Lieberman (Hirschhorn, American History Museum), Lauren Marshall (National Zoo, Freer-Sackler), Melinda Masdeu (Mall monuments and memorials), Brett Matthews (Everglades park history, Everglades trip planning), Javonne Stewart (Postal Museum), and Nayda Verier-Taylor (Anacostia Park, Vietnam Veterans memorial). We also developed a new section of our Web site devoted to issues and problems facing the entire park system. We had two dozen reporters in two groups working on their stories. Members of group one included Stephanie Davidson, Jeff Detloff, Minett Fouce, Jacquie Franciulli, Sandra Hurtado, Janal Montagna, Kelly Saks, Karina Smuclovisky, Amy Sofka, and Monica Yancy. Members of group two were Ben Brislawn, Matt Bunch, Erika Capek, Alex Gelep, Alcione Gonzalez, Karyn Meshbane, Erin Schlissel, Dustin Soucie, Alyssa Suarez, Krysten Swensen, Hunter Umphrey, Alexandra Vasquez, and David Villavicencio. The fall 2006 Philadelphia area travel group visits the newsroom of The Philadelphia Inquirer with Trey Emeno, son of Inquirer editor and UM alum Alletta Emeno and UM alum Marty Emeno (Photo by Alletta Emeno). Our fall 2006 group of reporters participated in the Journalism Program’s travel writing course. And it was a traveling group. Part of the group journeyed to Philadelphia and the surrounding area for work, while others visited Washington, D.C., the Las Vegas area, San Francisco, Boston, and upstate New York. Students participating included Delia Arevalo (Biscayne Bay boat ride, Gettysburg Visitor Center, Delaware boat trips, Shark Valley) , Tiffany Barranco (Boston Old State House, Boston North End, alligator hunting), Niccole Burns (E.A. Poe, Franklin Court, Ben Franklin) , Ali Bustamante (Big Cypress ORVs, Biscayne kids, Biscayne art), Erick Cipau (Everglades canoeing, Big Cypress hiking, Dry Tortugas), Dara D’Onofrio (Biscayne Park, Biscayne’s coral reef, Biscayne history), Sasha Grecco (Erie recreation, Erie history, Everglades wetlands), Channing Muller (Biscayne camping, Stiltsville, shipwrecks), Diana Offutt (Hoover-Boulder Dam, Roosevelt Island, air museum), Sarah Oline (E.A. Poe House, Independence Hall, Ranger Choice Program) , Khris Parker (Valley Forge, Liberty Bell, Gulf Seashore), Breyana Penn (Deshler-Morris House, Gloria Dei Church, Constitution Center), Jessy Schuster (Eisenhower house, Delaware River, Golden Gate), Allison Slutsky (Everglades first visits, manatees, Flamingo), Gerad Teague (Biscayne Park, Everglades City, Smallwood Store), and Michael Viera (Gettysburg, Valley Forge, Everglades). Delia Arevalo, Tiffany Barranco, Niccole Burns, Ali Bustamante, Erick Cipau, Dara D’Onofrio, Sasha Grecco, Channing Muller, Diana Offutt, Sarah Oline, Breyana Penn, Khris Parker, Jessy Schuster, Allison Slutsky, Gerad Teague, Michael Viera, and Brian Call contributed photographs. The spring 2006 project that focuses on the Boston metropolitan area national parks, national historical sites, memorials, and trails was reported by one dozen writers and photographers. The group included Rachael Borher, Christine Dominguez (Charlestown Navy Yard), Christine Dominguez and Vanessa Krause (Bunker Hill), Sofia Forteza, Vanessa Krause (USS Constitution), Tom Minervino (Longfellow and Fenway Park), Chaya Minkowitz (Quincy Market and Faneuil Hall and Old South Meeting House), Sandra Remilien, Arlene Satchell, Yasmin Schulten (Harbor Islands and Boston Light), Shira Strassman, Lola Thelin (Old North Church and Paul Revere House), and Skylar Zwick. In addition, Rachael Borher, Christine Dominguez, Sofia Fortez, Tom Minervino, Chaya Minkowitz, Arlene Satchell, Yasmin Schulten, Lola Thelin, Skylar Zwick, and Bruce Garrison contributed photographs. The spring 2006 group that worked in Boston, the Big Cypress, and the Everglades gathers on campus. Other spring 2006 writers focused their work on South Florida’s three national parks and preserve. Those reporters included Marcus Giusti, Tina McCarthy, Maribel Montalvo, and Kira Wisniewski. Marcus Giusti, Tina McCarthy and Maribel Montalvo also contributed photographs. A third group of reporters also focused their work on South Florida’s parks in spring 2006. These student journalists included Danielle Cohn, Dara D’Onofrio, Andrea Dale, Jennifer Farrell, Elizabeth Ginsberg, Brad Goodis, Ashley Guistolisi, Kim Hernandez, Sandra Remilien, Amy Salmanson, Kim Stabler, and Stephanie Webber. Danielle Cohn, Brad Goodis, Ashley Guistolisi, Amy Salmanson, and Stephanie Webber also contributed photographs. The writers and photographers who ventured into the Shenandoah Valley of Virginia in summer 2004 pause at the national park entrance. Our summer 2004 featuring writing and photography crew worked on a project about Shenandoah National Park in Virginia. Writers and reporters included Melissa Teich (kayaking the Shenandoah River and park ranger Clayton Jordan), Tenille Lively (Skyland horseback riding and hiking, and the geology-environment of the Shenandoah), and Ross Whitsett (Fox Hollow Trail, Shenandoah walking and hiking trails, and Appalachian Trail hikers) . Bruce Garrison, Tenille Lively, Melissa Teich, and Ross Whitsett contributed photographs. The project will be posted in late June. Writers and photographers take a break for dinner at Mulate’s Restaurant, a Cajun dance hall, in the French Quarter in New Orleans in spring 2004. Some of our spring 2004 reporters worked at the New Orleans Jazz Historical Park and the Jean Lafitte National Historical Park and Preserve in Louisiana. Writers included James A. Cohen, Rachel Cusick, Julie Major (Chalmette National Cemetery), Julie Major (Jazz park plans), Julie Major (French Quarter tours), Julie Major (Barataria Preserve), Veronica Puello, Omar Sommereyns (Cafe du Monde), Omar Sommereyns (Preservation Hall), Turner Sparks, Hunter Stephenson (voodoo ceremony), and Hunter Stephenson (voodoo shops). Rachael Henrichsen, Bruce Garrison, Julie Major, Hunter Stephenson, and James A. Cohen contributed photographs. Another group of reporters and writers focused their work upon Biscayne National Park, Everglades National Park, and the Big Cypress National Preserve in South Florida for spring 2004. These writers included Cherine Akbari, Yenisse Alonso, Amy Bailey, Deborah Block, Christine Dominguez, Brandie Feuer, Arlene Gonzalez, Christina Guzman, Silvia Guzman, Chris Hamilton, Vanessa Krause, Patrick Larsen, Tenille Lively, Rachel Luhta, Suzanne Martins, Jazmane Morgan, Elissa Rome, Deirdre Schwiring, Murray Shalom, Horacio Sierra, Jennifer Webb, and Alexandra Zayas. Bruce Garrison, Vanessa Krause, Tenille Lively, Yenisse Alonso, and Jennifer Webb contributed photographs. The summer 2003 South Florida parks project focused on Dry Tortugas and Biscayne parks. The reporters-writers contributing to this portion of the project were: Somy Ali, Caroline Astacio, Brenda Castillo (preservation efforts), Brenda Castillo (camping), Joyce Oliva, Dana Oppedisano, Chris Rivera (Fort Jefferson history), Chris Rivera (interpretive fort tours), and Charles Urstadt. Somy Ali, Chris Rivera, Yu He, and Bruce Garrison contributed their photographs. Yu He also contributed editing assistance. Emily Vaughn, working in a reporting course, contributed her Dry Tortugas feature and accompanying photographs in early 2004. Margarita Martin-Hidalgo contributed her Dry Tortugas story in late 2002. Our brave reporters and photographers visit the snowy Grand Canyon in 2003. The reporters-writers contributing to the South Florida part of the project in spring 2002 were: Aubrey Andel, Kristia Bared, Dan Boniface, Candice Bruno, Melissa Cantor, Adam Della Rocca, Rochelle Galang, Paloma Helm, Marilisa Jimenez, Caitlin Loeffler, Ernesto Londoño, Margarita Martin-Hidalgo, Jeniene Mikler, and Alexandra Scheufler. Bruce Garrison contributed his photographs. We offer thanks to School of Communication Webmaster Gabriel Brackman for his help with the newest version, launched in fall 2014, of our site. Without his efforts, the work could not have been done. We also wish to acknowledge the important original Web site design contributions of Prof. Kim Grinfeder of the School of Communication. And we are grateful for the help of Matt Byrnes in helping update the site during a three-year project from 2006 to 2009. The articles published on this Web site are reported and written by journalism students in the Journalism and Media Management Department in the School of Communication at the University of Miami in Coral Gables, Fla. and copyrighted by the individual authors. Content within this Web site may not be used without permission of the authors. Content within this Web site may not be used without permission. For more information about the work contained on this Web site, contact the project editor, Dr. Bruce Garrison. Our intrepid reporters and photographers in the Dry Tortugas in 2003.